Designers like Ronaldo Fraga, Colcii and Samuel Cirnansck impressed at the increasingly high-profile South American centre of fashion. Vibrant hand-gestures, festivity and love of juicy colour can cause Brazilians to be disparaged as fluffy. But Sao Paulo fashion week proved far more down-to-earth than its supposedly more straight-laced counterparts. While other aspiring fashion capitals boast that they pose immediate threats to Paris, London or New York, the decade-old Sao Paulo entry has earned a significant place on the packed fashion week calendar by developing and presenting its own distinct and authentic personality. Few of the Brazil's leading designers are sold outside South America. Within that territory, however, they enjoy the loyal support of a very discerning local clientele. Big name brands that sell well everywhere have strong competition within Brazil from the designers who cater to their compatriots' sensual, chic sensibility. Although more than a few high-wattage supermodels could be seen on the catwalks, the week's focus was clearly, and seriously, on the fashion. "Sao Paulo is not about celebrities," confided Vogue Brazil's Camila Leite. "The organizers are interested in appealing to experts and people with their own style. They are not looking to create showbiz spectacles." 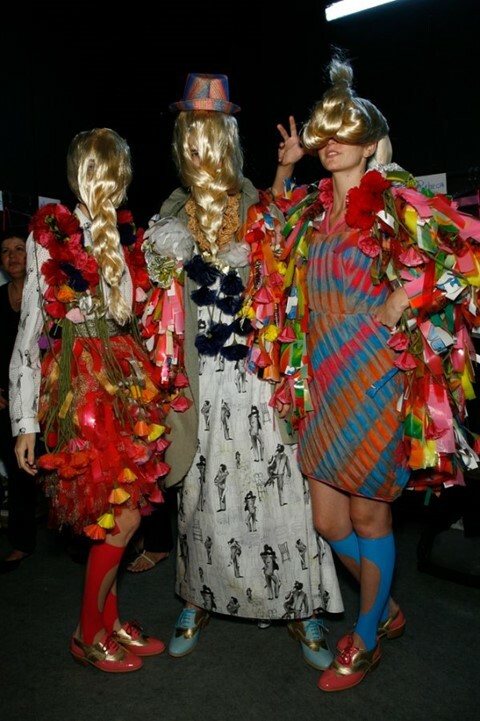 The organisers of Sao Paulo's fashion week described Brazil as a leader in "fun fashion." However, that understates the week's diversity in design, inspiration and festiveness. I had to leave two days before the shows stopped to hop back to Berlin for their fashion week. Before I scrambled sadly to my flight, I had delightedly experienced a flurry of inspiring shows that fueled my interest in Brazil's wealth and breadth of talent. The hyper-popular Colcci show at the Bienal Pavillion in Ibirapuera Park offered the most mainstream form of fun. The clothes were mostly jeans, flowing, sheer, free-spirited dresses and lots of bouncing fringe which willfully took a backseat to the crowd-pleasing energy generated by the supermodel roster. The blogs mourned the MIA status of Gisele, who missed her hometown's fashion week for family time. But fellow Brazilian-born Victoria Secret supermodel Alessandra Corine Ambrósio burned away on-lookers' disappointment with her billion-watt smile and pure hotness. However, other types of fun were evoked elsewhere, such as the Ronaldo Fraga show, which was a perfect re-enactment of the high-minded Mamulengo puppet-show for intellectually reared kids. It may have been a little inconsiderate to load the audience up on sugar, in the form of "Fun-sized" mega boxes of candy stashed in the goodie-bag, and then have a Pina Bausch-style accordion-holding dancer hold forth while walking among the chairs. The show itself was too long and unedited by at least a third. But overall, the use of massive puppet-masks, Magritte-inspired surrealist gestures, juicy Latin-American colors and theatrical symbolism effectively highlighted the wearable and well-structured garments. However, I found the most rewarding blend of theatre and skill at the Samuel Cirnansck show, where sculpted forties-style latex and fabric dresses, quilted poppy-coloured skirts and a brilliant grand wedding gown with a quilted train were styled with lampshades, a table attached to a model's waist and a soundtrack evoking The Cook, The Thief, His Wife and Her Lover. The looks recalled Disney and Tim Burton but they were so beautifully rendered that they emerged comfortably into three-dimensional reality. Off the catwalks, real insights into Brazilian fashion were found at the second edition of the Casamonda Brail showroom. Located in the wood-paneled lower level of the Unique hotel, which one admiring journalist from Japan described as "a massive, elegant watermelon," forty-four of Brazil's leading brands had booths showcasing the commercial range of their collections. The estimated sales of designers such as Carlos Miele, Gloria Coelho, Iódice, Lenny, Isabella Capeto, Reinaldo Lourenço and Carina Duek, were around $40 million. Although there was less overt innovation on view than had been seen on the catwalks or Brazil's streets, the pooling of so many otherwise scattered designers provided a few valuable discoveries and an insider's view into Brazilians' real priorities when dressing for style. As would be expected, there were a few flashy little D&G-style bikinis on display alongside the profusion of little suits studded with sparkle and endless arrays of evening wear. There were a few too many details for this American's taste, but designers such as Alice Dias and Isabela Capeto demonstrated an interesting, artful way with drapery and fabric that evoked a nice sensual and gracefully feminine sensibility. Cecilia Echenique offered the most interesting work, which included burgundy and navy silk evening attire accentuated with thin knitted and jeweled harnesses wrapping around the body in a mixture of craft, enclosure and innovative eroticism - an apt metaphor for the city's fashion scene itself.